I made the photo above-not the cover-and the photography in the book is NOT by me- but nice and colorful! Then I decided to set up this shot and basically, all I did was grab a couple of bags that were within reach of my desk. Not, like, the only bags of yarn in my office. I realized a lot of yarn has accumulated.....let's just say, I do indeed have a stash. 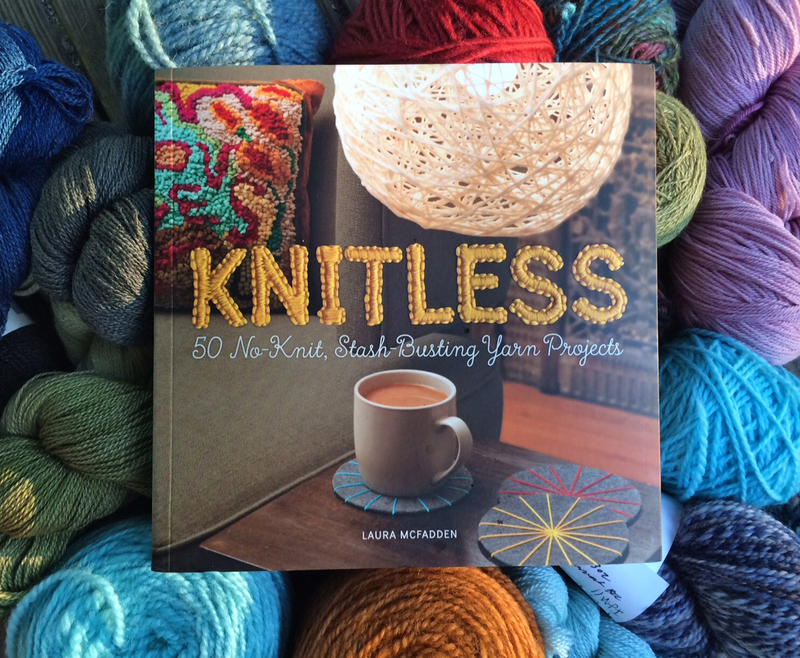 Laura McFadden's crafty book Knitless: 50 N0-Knit , Stash-Busting Yarn Projects is full of ideas for us. Some projects are quickies, some take time and concentration. She is an experienced crafter in many media, so she brings in paper arts, jewelry, embroidery, coil and coin rugs, macrame--and more that mix it up. Nary a knit or crochet pattern in here. Perfect opportunity to stretch your craft muscles a little while using up yarn that is lying fallow. 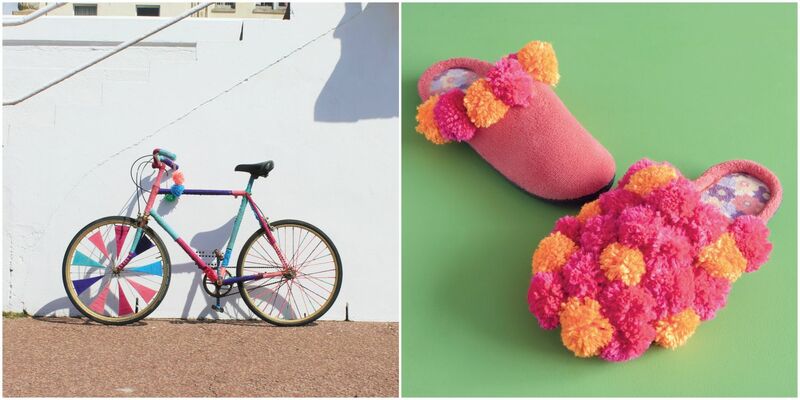 Some projects offer a technique or idea that you can roll with, like the yarn covered bicycle, or a yarn-bombed chair that has pre-knit/crocheted recycled components. Love, love, love. (Warms my CraftActivism heart). Some give you ideas to use yarn gobbling elements, like pompoms--I'm thinking the PomPom Covered Slippers would make a great gift, and fun in the process, as well. Other projects are more "Make and Take"--detailed instructions to make a specific item, complete with templates for re-creating the piece, exactly. This kind of crafting isn't my jam, but it has huge appeal for those who want to try a new craft successfully, and when you want a project you can claim as done by the end of the day. 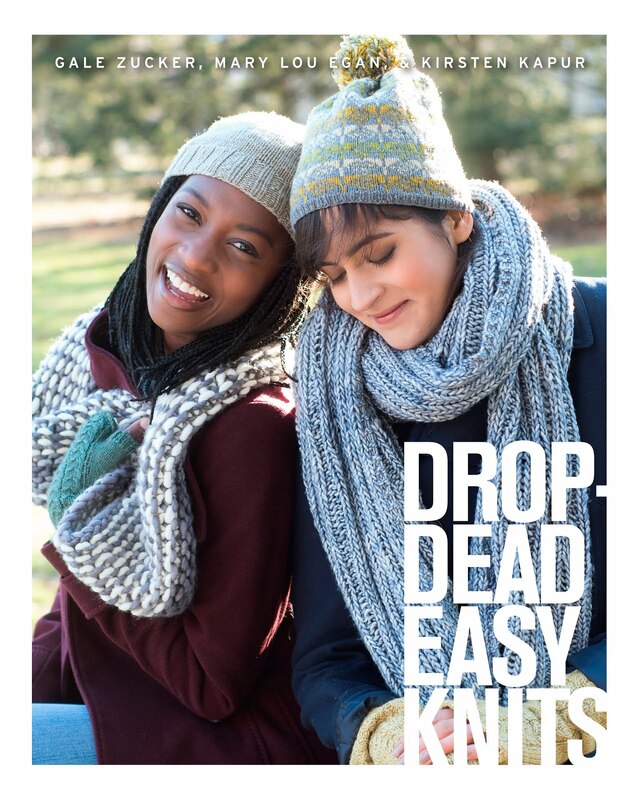 Coming off of making a book with 28 projects in it, all knitting, I tip my hat to the author for putting together fifty projects with clear instructions and photos. This is a book I'll keep on the shelf for a day when I feel like messing around and making something but I'm not sure what. 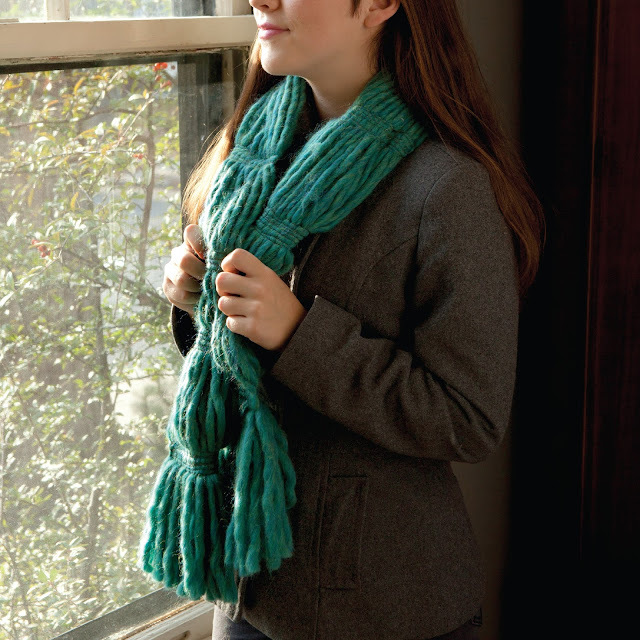 The No-Knit Quick Scarf (above) is so simple it's crazy- I have seen a cheapo version in a store and loved it. 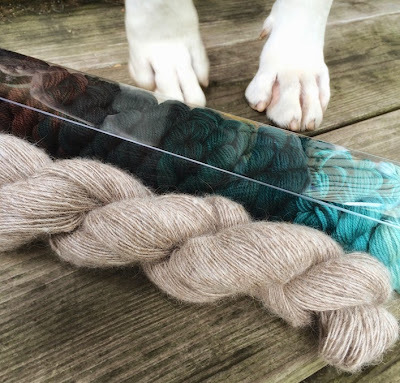 I can imagine it with a leftover single skein of something delicious like Malabrigo Rasta. What else might I be creating from in here? 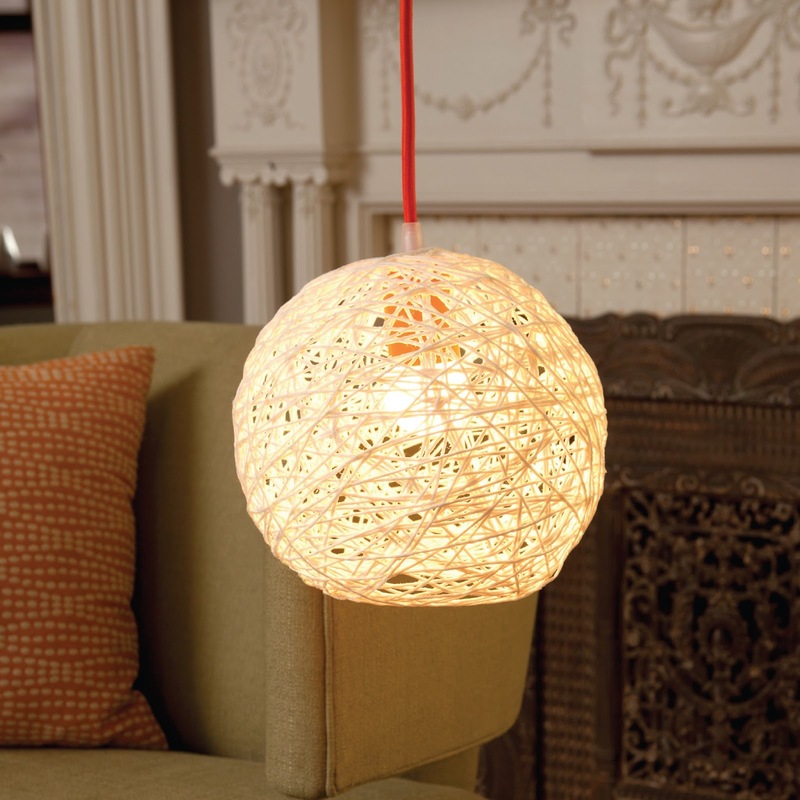 The 70-'s retro string art lamp brings back memories of trying this with my mom--I didn't have much patience at the time, mine was a disaster. I'm so tempted to try again now in my more, um, mature version of my craftng self. GIVEAWAY ! Want a copy of Knitless: 50 No-Knit, Stash Busting Yarn Projects by Laura McFadden? Leave a comment below, by midnight September 20, 2015. Since I am still using the frustrating yet free Blogger platform, you'll need to include or spell out your email (as in MeATcraftqueenDOTcom) or else Blogger will make you impossible to reach. This book was sent to me by Running Press, the publisher. The above review (unless you just skipped to the giveaway and if so--shame on you) is my unbiased opinion. If I didn't like it, you wouldn't be reading about it. I was making many things this summer. Except for, obviously, blogposts. 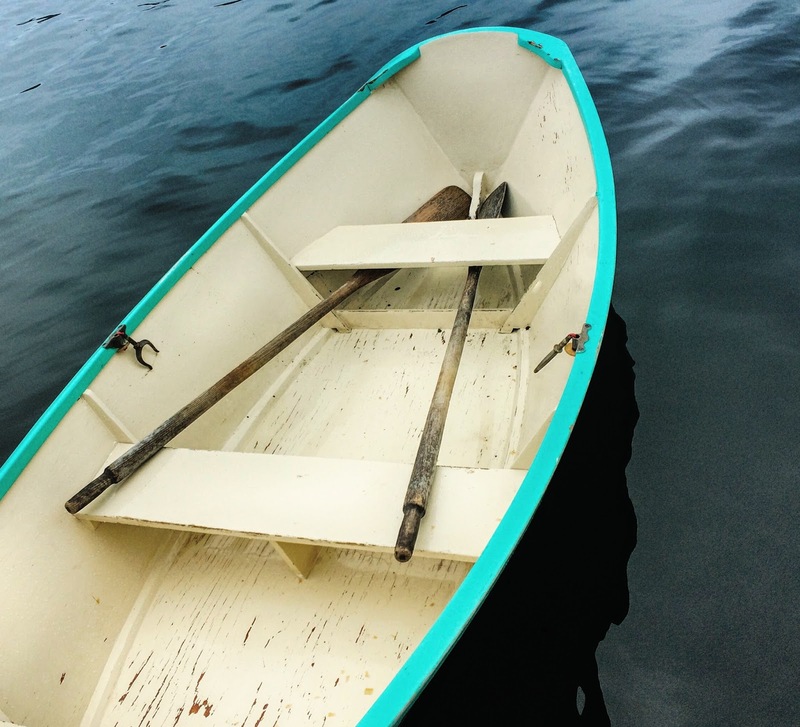 Sweet rowboat that carried us ashore on Nash Island at the start of summer. Waaaay overdue blogpost about that weekend. 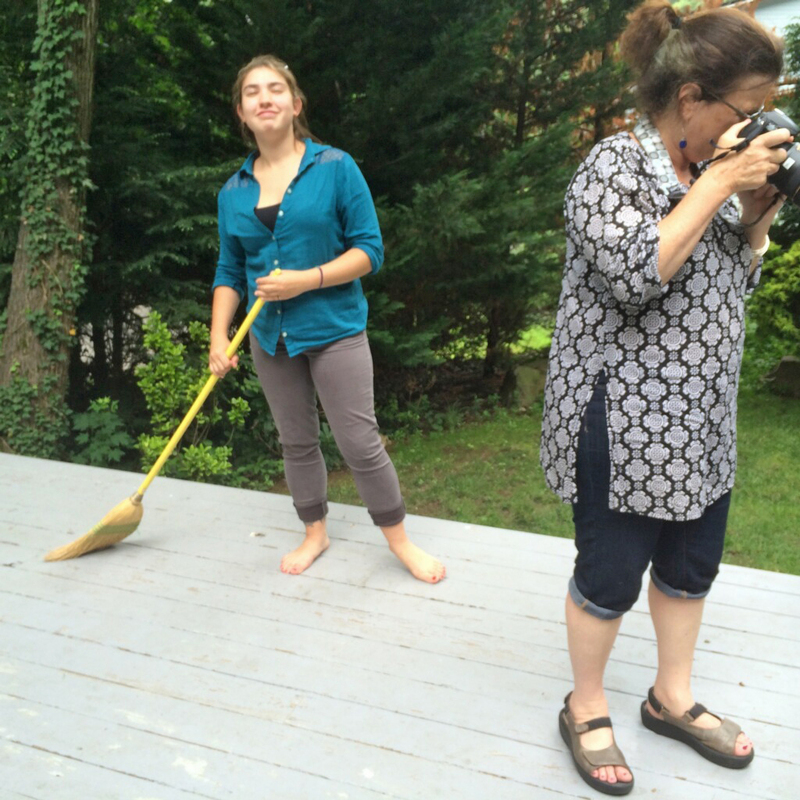 A great deal of my making this summer surrounded a very special book project. It's a beautiful knitting book, from Clarkson Potter, but it won't be out for a year (tap.tap.tap. i'mma gonna wear a hole in the table drumming my fingers in anticipation). Here's a photo from the wrap of the book shoot, at the end of some very long steamy photo days. We cleverly ended on the beach...and we also unconsciously dressed as if we planned it. Cute group, right? 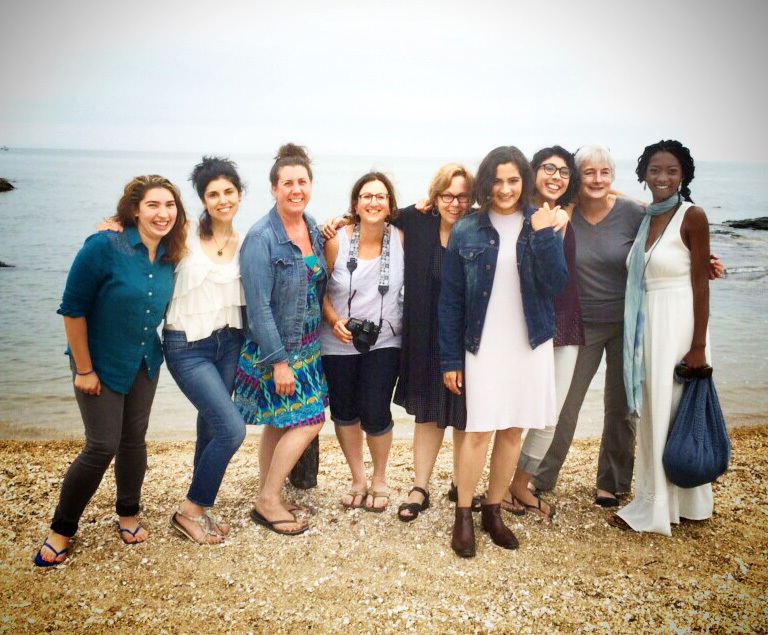 You're probably recognizing my co-authors Kirsten Kapur and Mary Lou Egan and the rest of the crew and models who all worked their tushes off. Aaaannnd a super dorky BTS moment. There are wonderful shots of us working but all show too much, I can't spill the beans on the knits. Very frustrating! I have been proud of every book I've worked on but this one is going to be so freakin' good and you will want to knit everything in it. I already am.... That's all I am saying on it for now. The aforementioned yarn, from Rhinebeck last year. With Bobo's paws, just because. -stitching- major fail. No progress on the Alabama Chanin projects, and despite swearing I'd crack out the ol' Singer, and make at least one Sonya Philip tunic, and some cute little frocks for Zoe, who couldn't be more appreciative and excited to have me make things for her...nope. The weather has been way too good for weeks, I can't bear to be inside. Plus, see making a book, above. - books -most recently A Constellation of Vital Phenomenona by Anthony Marra , one of the best I've read...period. Fiction, brilliant, moving. Go get it. - swimming- every day at the beach, still. Fingers crossed to make it into October this year. - reconnecting with old friends- yup. In June,with dear but farflung college friends , then in July, my high school reunion-- a really down to earth and fun one, where the kids I hung with in 3rd and 4th grade and I all wondered why we lost touch in high school and became our old selves again. It was eye and heart opening. Highly recommend making the leap. - shooting more knits and yarn and people -- yup. It's my job but I never get tired of it. Wait'll you see some of the new designs I've shot lately, and some amazingly talented new clients. - blogging--well, as I said at the top, definitely failing. I 'm on Instagram a lot, and it's just too easy to neglect blogging...time to get back in the habit. - teaching-- the Photo Editing webinar from Interweave is at last available reliably from the link. I teach it live too, in person, whenever you want me to...just give a shout. And, I'm going to be at Fibre Space in November. yay! So what have you been making? What's next on your list? *still room in my class. C'mon up and join me!